Where are all my Canadian/Canada-loving readers?? If you live up in our northern neighbor country or have visited there for any significant period of time, then I bet you’re no stranger to the “all-dressed” phenomenon. I had never heard of it until my trip to Quebec City a couple of weeks ago, when my flight attendant friend and I were browsing through a convenience store for some hotel room snacks and she informed me that the “All-Dressed” flavor of chips was a “thing” in Canada. How did she describe it to me? “It’s like a shmorgasborg of a ton of different chip flavors.” What can I say, I was intrigued so we grabbed a bag to enjoy with a nice frost local beer in our room before dinner. The two words I would use to describe those All-Dressed chips are “deliciously interesting.” They’re just one of those things that you can’t quite figure out. You’re not quite sure why they taste so delicious, they just do. 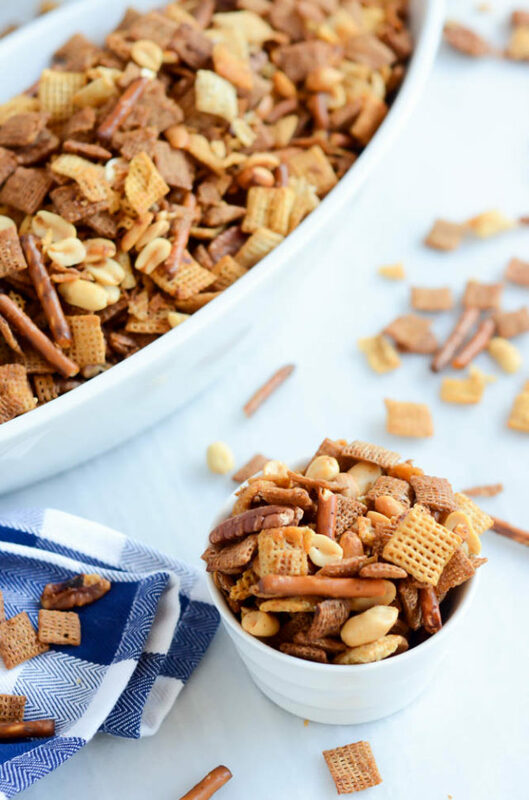 I immediately knew I wanted to bring this idea back to my homeland, and this All-Dressed Party Mix is the super-tasty result! Now, I know I still owe you my Travel Diaries post for Quebec City, but I just couldn’t wait to share this recipe with you. It is, after all, the perfect snack to have on hand as you’re drinking bubbles and counting down the minutes until midnight on NYE. Did I mention that it’s all made in just three hours in the slow cooker? If you ask me, there’s no better way to make an addictively delicious snack when you’re entertaining a crowd. Speaking of New Year’s Eve, tell me, what are your plans? I am a bridesmaid in a dear high school friend’s wedding that night, so the hubs and I will be celebrating with her and dancing the night away in Santa Cruz. Unfortunately, that means we won’t be able to chow down on All-Dressed Party Mix all night, but you can bet we’ll be packing some Ziplocs full for our trip up to Tahoe the next day! That’s right, we’re headed to Tahoe with both of our parents on New Year’s Day and we couldn’t be more excited. The past couple of times we’ve been there we’ve JUST missed the snow, so this time we wanted to be sure we made it up there while there was still fresh powder on the ground. The weather report is looking good for that so far! 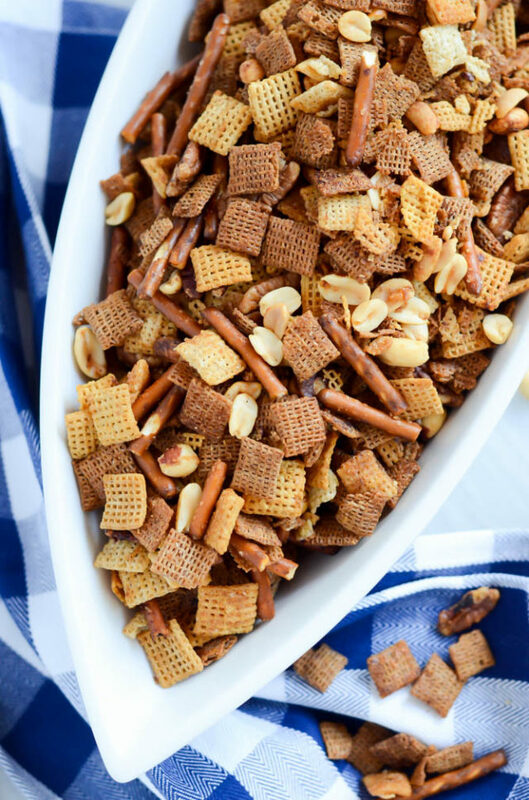 So, let’s get back to this All-Dressed Party Mix. After a little bit of Internet research, I discovered that the “all-dressed” seasoning actually DID consist of a little bit of everything. We’re talking BBQ sauce, ketchup, sour cream and onion AND salt and vinegar. Wowza. No wonder I couldn’t quite figure out what was going on when I first tasted it! 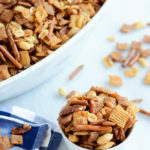 I decided to make my All-Dressed Party Mix a riff on the classic Chex mix after my friend and I grabbed a bag of All-Dressed Snack Mix later in our trip that we were quite disappointed in. I told her I bet I could make a better version and, boy, did I deliver! I’m such a good friend. Jo, this one’s for you! 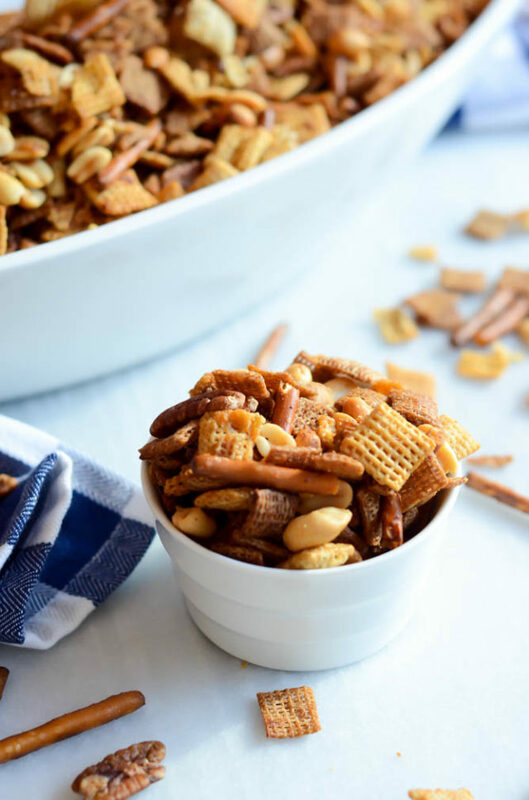 Once you have all of your ingredients, the rest of this All-Dressed Party Mix recipe is SUPER easy. Simply dump all of your cereals, nuts, etc. into your slow cooker, mix up your dressing, and pour it on. After giving the mixture a good stir, all that’s left is to turn the slow cooker on low for three hours and give the mixture a stir every once in a while. Once that’s done, you’ll need to spread the mix out and let it cool a bit, then you’re good to go! Bowls and bowls of deliciousness ready to snack on all through a long night of festivities and watching the clock countdown to midnight. Now who’s bringing the bubbly?? 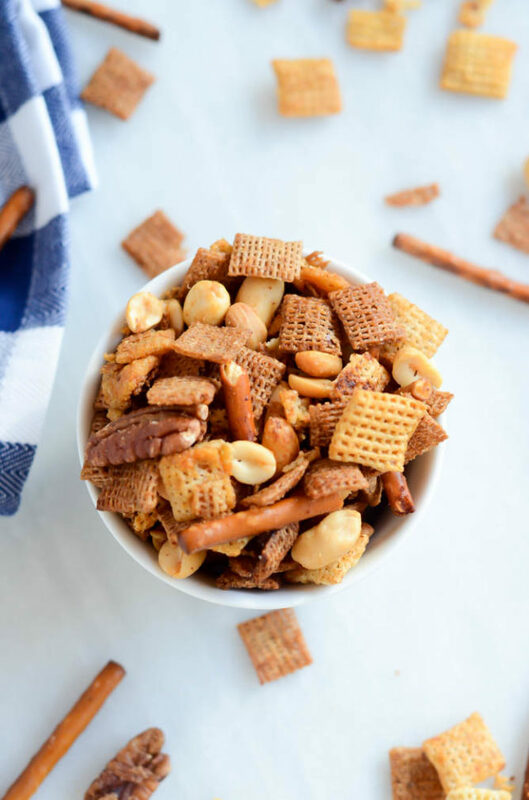 Traditional Chex mix gets a makeover with one of Canada's favorite seasoning combinations - BBQ sauce, ketchup, onion and vinegar come together to make this totally addictive party mix! 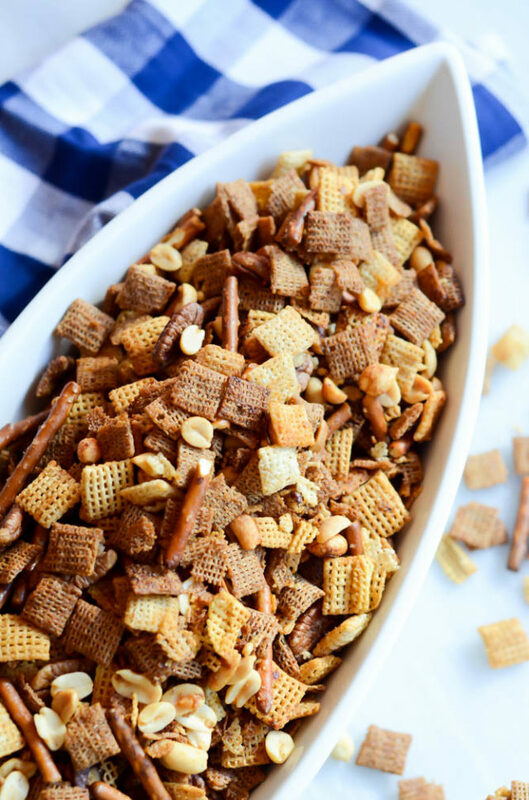 Combine Chex cereal, pretzel sticks and nuts in your slow cooker. In a small bowl, combine the melted butter, BBQ sauce, ketchup, salt, onion powder and vinegar. Pour over the cereal mixture and stir to coat evenly. Turn slow cooker on low for three hours. Stir mixture a few times throughout the cooking process so that the mix on the bottom doesn’t burn. Pour party mix onto a large cookie sheet and spread out evenly. Let cool for about 30 minutes and then serve, or store in an airtight container or resealable plastic bag for up to two weeks. Good recipe, you can use this recipe for anything in a slow cooker. Way to much Salt though. I would try just a pinch of salt instead. Ryan – Thanks for your feedback! That was the amount of salt that worked for me, but I always encourage readers to taste as they go and adapt my recipes to whatever works for them 🙂 Happy cooking!